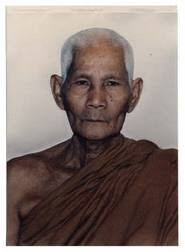 My teacher, Phra Ajaan Fuang Jotiko, similarly did not write any books during his life time. In fact, he didn't allow any one to take notes of his talks as his point was that the listener ought to put full attention to the Dhamma that was being offered and if a particular point of the teaching hit home with the listener, it would stick right in his heart and there isn't the need to try to recall etc. However, after his passing away, Phra Ajaan Thanissaro collected excerpts of teachings from among Phra Ajaan Fuang's students and compiled them as a book to commemorate his passing away. The original is written in Thai and the English version is given below. his most important teaching to me was " Keep The Breath In Mind, All The Time". When you truly see how important and beneficial this practice is, you would be, like me, forever grateful for this simple but very insightful instruction of his. Sadhu! Anumodana!